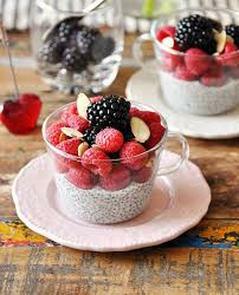 Combine the almond or coconut milk together with the chia seeds, vanilla extract and fruit in a glass jar with a lid. Cover and shake well, set aside for 15 minutes. Give it another good shake then refrigerate overnight or at least 5-6 hours. Garnish with slivered almonds and enjoy!